if tens of thousands people per day on the busy roads see your brightly lit ads? Discover the 1st of its kind! Introducing the newest, most innovative, and eye-catching marketing medium available on the road! SIMPLY PUT, WE DRIVE ELECTRIFYING ADS TO CAPTIVATE YOUR AUDIENCE, ATTRACTING ATTENTION TO YOUR BRAND, BUSINESS, OR EVENT. With more than 700,000 residents not including visitors and tourists, Denver is becoming extremely busy city and a booming place for business. This works perfectly with our in-your-face style marketing. We go to where your audience are, capturing attention for your business, promotion, or event. Imagine a busy downtown Denver full of pedestrians and drivers, when out the crowd of cars, your finely crafted illuminating ads emerge, slowly make their way through traffic, standing out in the middle of a crowded area during rush hour, garnering tens of thousands of impressions a day. Your ads cannot be turned down or turned off, and when prepared correctly, turned away from. Ready to see what we’re talking about? YOU MIGHT BE THINKING, HOW EFFECTIVE IS THIS COMPARED TO TRADITIONAL STATIC BILLBOARDS, TV, RADIO? Good question! No other medium can guarantee coverage at the exact physical locations where your audience lives, works or plays. And according to Product Acceptance and Research Inc. 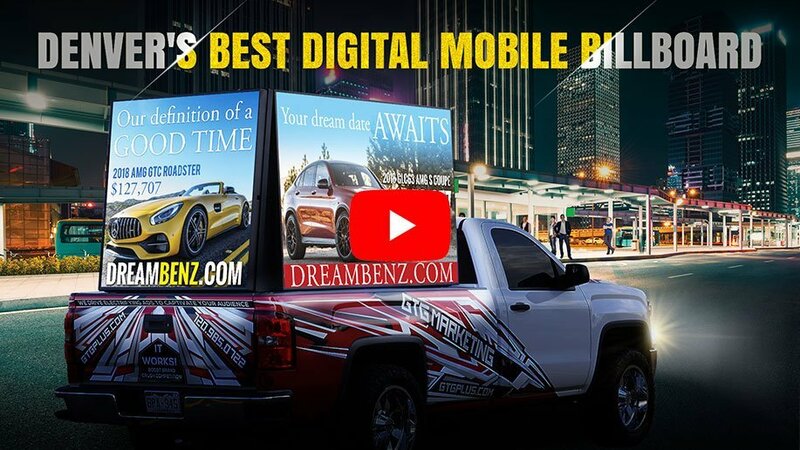 Mobile Billboard Ads resulted in an increase in sales of 107% versus a 54% increase for static billboards. 94% of respondents remembered mobile billboards with an amazing 80% remember of specific ads. 96% of respondents said mobile advertising is more effective than traditional outdoor advertising. Americans report spending an average of 15 hours a week in-car, either as driver or passenger. Younger audience ages 18-34, who aren’t watching TV as much, have huge exposure to outdoor media. GTG is a known and trusted source among business owners in Colorado when it comes to delivering exceptional products/ services that meets our clients’ needs. We are proud to have served over a thousand local businesses and maintain a 5 star status on both Google & Yelp. We treat your business like our own, accepting only the highest quality products and services. 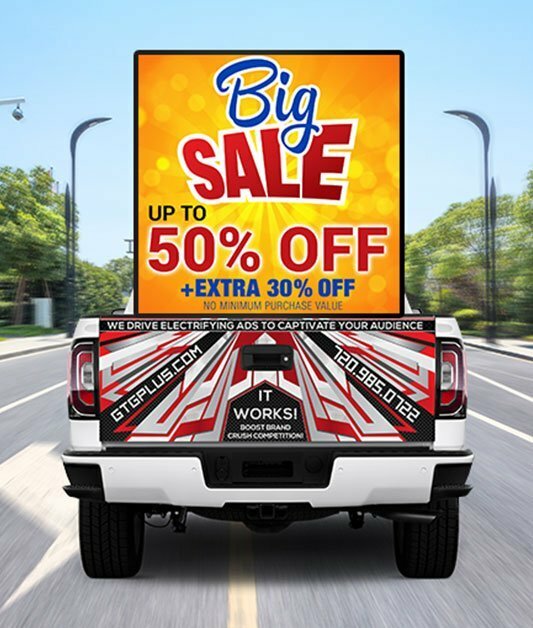 Our truck is equipped with 3 large, high quality full color LED digital billboards (5mm pixel pitch) to prominently display your ads even under the brightest sun. With an experienced team of creatives on your side to make sure your ads stand out, you can rest assure that your ads won‘t get ignored. Unlike most mobile billboard companies, we don’t charge a set up cost as long as you place the minimum order with us. We offer free ad design, and your ads are easy to replace since we don’t need to print and install materials like regular mobile billboards. Uniquely different from all other mobile billboard companies, our truck is creatively and artfully designed to be an attention grabber by itself. Our signs can play high quality videos. We offer flexible routes & time, based on your marketing campaign. NO CONTRACT, NO SET UP FEE. DON’T LIKE THE RESULT, YOU CAN CANCEL ANYTIME. for every 5 days purchase. for every 3 days purchase. Additional 20% to regular prices if available. $125/HR; Minimum 2 hours purchase for photos, and 4 hours for videos. Includes Editing.